“Section 596775. (A)In addition to the school bus safety standards of Section 565195, all public school buses manufactured after July 1, 2020, must be equipped with integrated three-point harness seat belts for each passenger. This requirement does not apply to public school buses leased, owned, or otherwise furnished by the State Department of Education before July 1, 2020 and which continue in such use after that date. 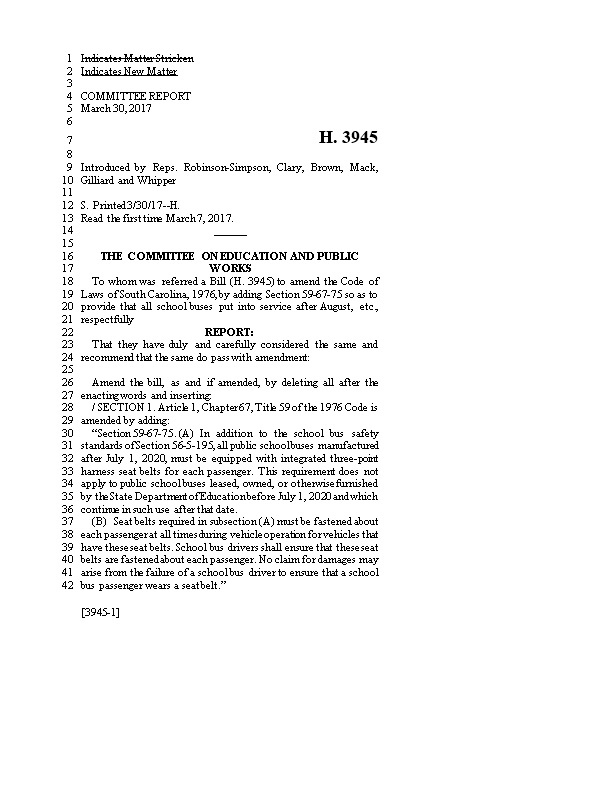 TO AMEND THE CODE OF LAWS OF SOUTH CAROLINA, 1976, BY ADDING SECTION 596775 SO AS TO PROVIDE THAT ALL SCHOOL BUSES PUT INTO SERVICE AFTER AUGUST 1, 2020, MUST BE EQUIPPED WITH LAP SEAT BELTS FOR ALL PERMANENT SEATING ACCOMMODATIONS, TO PROVIDE THIS REQUIREMENT IS IN ADDITION TO EXISTING SCHOOL BUS SAFETY REQUIREMENTS, TO PROVIDE THESE SEAT BELTS MUST BE PROPERLY FASTENED ABOUT PASSENGERS DURING VEHICLE OPERATION, TO PROVIDE SCHOOL BUS DRIVERS SHALL ENSURE THAT THESE SEAT BELTS ARE FASTENED ABOUT EACH PASSENGER, AND TO PROVIDE NO CLAIMS FOR DAMAGES MAY ARISE FROM THE FAILURE OF SCHOOL BUS DRIVERS TO ENSURE PASSENGERS WEAR THESE SEAT BELTS;TO AMEND SECTION 596710, RELATING TO DEFINITIONS CONCERNING THE TRANSPORTATION OF STUDENTS AND SCHOOL BUSES, SO AS TO DEFINE THE TERM “LAP SEAT BELT”; AND TO AMEND SECTION 596740, RELATING TO THE APPLICABILITY OF CERTAIN REQUIREMENTS OF PUBLIC SCHOOL BUSES TO PRIVATE SCHOOL BUSES, SO AS INCLUDE LAP SEAT BELT REQUIREMENTS. “Section 596775. (A)All school buses put into service after August 1, 2020, must be equipped with lap seat belts designed and installed in compliance with United States Department of Transportation motor vehicle safety standards for each permanent seating accommodation. This requirement is in addition to the school bus safety standards of Section 565195. (b)privately owned and operated for compensation for the transportation of children to or from school. “Section 596740. (A)All school buses owned and operated by a private school or operated under contract for a private school must conform to State laws and regulations of the State Board of Education with respect to painting, lettering on the front and rear of the bus, use of stop arm and warning lights for loading and unloading pupils on the highway, maximum speeds and stopping at railroad crossings, and lap seat belts. SECTION4.This act takes effect upon approval by the Governor.